Today was Tyler's unit's Christmas dinner. After church my mom, the kids and I headed to Eleanor. When we got there the gym was decorated for Christmas and crawling with bikers and motorcycles. You read that right, bikers! Their chapter of The Brothers of the Wheel paid for, prepared and served a GIANT Christmas feast. The menu included ham, turkey, stuffing, mashed potatoes with homemade gravy, green beans, corn, potato and macaroni salad, cranberry sauce, rolls with butter and a 40 foot dessert table! The portions were so large that the trays were collapsing without 2 hands. Not to fear, 2 bikers helped mom and I get Tristan and Tyler's plates back to the table. 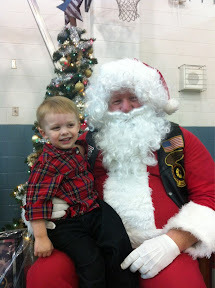 The highlight, as far as Tristan was concerned anyway, was SANTA! 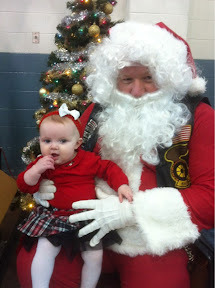 Not just Santa, oh no, Biker Santa. Tristan sat on his lap and told him he wanted "Star Wars and candy" 3 times! He keep telling me, "Santa says, 'Alriiiight.'" The last time he sat on his lap he got a stocking full of treats and a toy! Scarlett sat on his lap, too. She liked his beard which is no surprise because, as Auntie Alex can attest, she has a thing for hair right now. I call this picture her pinup look, haha!